Jason Helgerson, New York’s Medicaid Director, will address the Albany Roundtable on Wednesday, March 14. In January, 2011, Governor Andrew M. Cuomo announced in his State of the State address that he had issued an Executive Order aimed at redesigning New York’s outsized Medicaid program. The order called for the creation of a new Medicaid Redesign Team to find ways to save money within the Medicaid program. New York spends more, per capita, on Medicaid than any other state in the country. In an effort to rein in the program’s rising costs, Gov. 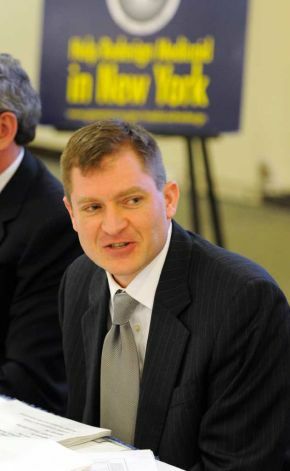 Cuomo tapped Jason Helgerson to be the state Medicaid director, and to serve as Executive Director of the NYS Medicaid Design Team. Helgerson previously oversaw Wisconsin’s “BadgerCare Plus” and Medicaid programs, and is credited to have trimmed the state’s Medicaid budget by 4.8%. The Wisconsin model focused on making it easier for people to enroll while reforming reimbursement rates, but without dictating how that would be done. The cost for the luncheon is $15, which may be paid at the door. The University Club will serve lunch from 12:00 noon to 1:00 p.m., with the program commencing at 12:30. Reservations for the March 14 luncheon are required by Monday, March 12 and may be made by calling 518-431-1400 (the Albany Colonie Regional Chamber of Commerce) or by sending an e-mail to albanyroundtable@yahoo.com. For additional information visit www.albanyroundtable.blogspot.com.